The field of nutrition and dietetics is thriving in the United States. According to the US Bureau of Labor Statics, jobs in the field of dietetics are expected to increase by 14% from 2014 to 2024, faster than the average rate of other careers in the US. Entering into the field of dietetics right now is a great choice for students who are passionate about health and nutrition. With rates of obesity, diabetes, and other lifestyle related illnesses on the rise, as well as an aging population, nutrition professional are needed more than ever. What is the path to becoming a Registered Dietitian in the United States and what do career prospects look like? 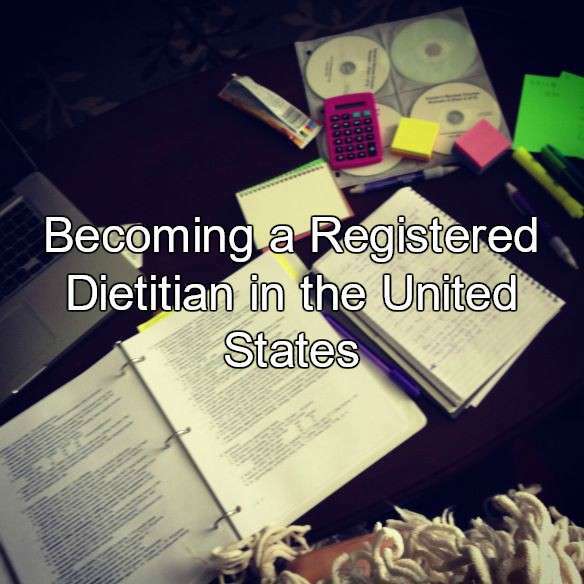 Becoming a Registered Dietitian (RD) requires an undergraduate degree and completion of course work laid out by the Academy of Nutrition and Dietetics, the governing board of all dietitians in the United States. This coursework is designed to prepare aspiring RDs for the required internship and to become eligible to sit for the licensing exam to become “registered”. Courses generally include: microbiology, several semesters of chemistry, anatomy and physiology, biology, food science, clinical nutrition, administration, management, and food service. The most direct way to complete this coursework is to major in Nutrition and Dietetics as an undergraduate at an accredited university, which will usually take about four years to complete. Coursework can also be completed as a graduate student, which will take approximately two to three years to complete. The end goal is to meet the requirements to apply for the internship, then take the registration exam. Starting in 2024 all students will be required to complete a graduate degree before sitting for the RD exam. This is a change in the field that will be required by the Academy of Nutrition and Dietetics. People who get their RD license before 2024 have this requirement waived for them. The goal of this change is to attempt to increase the academic level of the average dietitian to hopefully increase salaries, which are generally low compared to similar fields. The dietetic internship is where a dietitian is trained in various areas of practice. Most internships include rotations in community nutrition, foodservice administration, school foodservice, and clinical nutrition. Other programs may include specialized rotations in nutrition research, dialysis, private practice, pediatrics, and long-term care. The purpose of the internship is to expose and train future RDs in variety of potential types of jobs available. Unfortunately, due to budget cuts and increased interest in the field of dietetics, internships have become quite competitive. Less than 50% of students who apply to internships get accepted to a program. This has made the field of dietetics increasingly competitive for students, many of whom get rejected year after year. Those who do get accepted into internship programs generally have an excellent academic record and have demonstrated some level of experience in the field of nutrition, even if it is just as a volunteer. Personally, when I was a student I worked/volunteered with several dietitians in private practice because that was my area of interest. I also worked at a popular commercial diet program where I counseled their customers on general weight loss and sold their weight loss product. Many students try to get jobs in hospital kitchens so they can gain experience in therapeutic diets and see how hospital food service works. A combination of real-life experience and a strong academic record can increase chances of acceptance. Once the coursework and internship are completed, students can finally sit for the RD exam. This exam only needs to be taken once and if passed it allows registration as a dietitian and allows students to begin practicing. The RD exam covers a wide variety of topics that includes information from coursework as well as things learned during internship. Some entry-level jobs will accept applicants who are eligible to take the exam, but have not done so yet. These jobs generally have requirements that new graduates must pass the exam within a certain amount of time after being hired. Whereas other jobs will want only candidates who have already passed the exam. A great place to start as a new dietitian is to apply to work at a hospital in clinical nutrition and most RDs in the United States begin this way. This experience will provide a solid foundation in medical nutrition therapy, which is the basis of RD practice. It will also help expose new RDs to various disease states and areas of interest, so if they want to specialize later they will have some experience. But, starting as a clinical dietitian is not required, especially if other are opportunities available. My first job as a new RD was in health education, where I taught classes on weight management and diabetes. A great way to land a first job is to utilize online job boards, but many new RDs get jobs from places where they interned. It may take a bit of time, but in most urban areas entry-level dietitian jobs are pretty easy to come by due to the high demand between hospitals, long-term care facilities, schools and outpatient clinics. The demand for RDs is increasing and the opportunities in the field continue to expand. Yes, the road for most students is a bit long, especially with internship acceptance rates being so low. But, there are significant benefits to being an RD. First, with such a high demand, there will always be job opportunities available in the United States. The demand continues to grow. It is unlikely to decrease because all hospitals, nursing homes, and long-term care facilities require at least one dietitian on staff as a part of most State and Federal requirements. Although these jobs may not always be glamorous, they are fairly readily available and easy to come by. Overall, the pay for dietetics is a bit low, especially when compared to other jobs in the healthcare field with similar educational requirements. The average dietitian salary is $55,920 according to NutritionEd.org. But, this can vary greatly depending on the state and is usually higher in urban areas with a higher cost of living. With the increased demand for dietitians and the upcoming requirement that all RDs hold Master’s levels degrees, salaries may improve over time. Dietetics is not a very stressful career path and does not usually require long working hours which may be great for those seeking a bit of work/life balance. This is likely why it’s an appealing career for women who make up 95% of dietitians in the United States, although this is beginning to change as more men enter the field. Also, a career in dietetics is never boring as there are so many different areas in the field. Holding the RD license allows trained dietitians to easily work in and specialize in different areas of nutrition which is appealing to those who get bored or like a new challenge from time to time. Overall, becoming a Registered Dietitian in the United States is a versatile and exciting career path with the increasing demand and potential for work in the future. Ana Reisdorf is a Registered Dietitian Nutritionist and freelance writer with 10-years experience in the field of nutrition and dietetics. Currently, she works to share her passion for nutrition on a larger scale as an author. She has written for various online publications, such as The List and Dr. Josh Axe. Her latest article “Beauty and Nutrition” was published in Today’s Dietitian magazine. Ana brings her extensive nutrition experience, understanding of psychology, and compassion to every article and client interaction. She has a passion for helping people achieve ideal health and make transformational changes in their lives.